Are you considering getting memorial jewellery or art made from your loved one’s ashes? If so, you may even have wondered about the artists behind cremation or memorial glass. After all, sending away your loved ones’ ashes in the post involves a lot of trust. 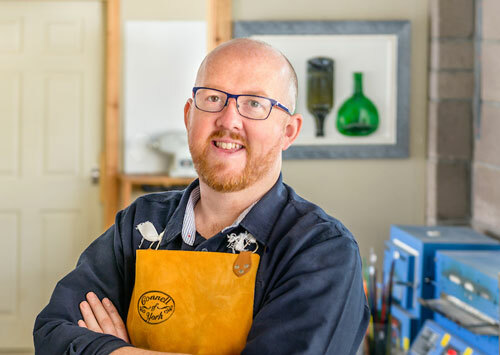 It’s people like Kenny Scott of Ash Glass Design who have the task of receiving them at the other end, before carefully crafting them into beautiful pieces of jewellery or art. It’s a intricate process that involves a lot of skill and experience. That’s why we’ve published this special interview with Kenny Scott, so you can learn more about his background as an experienced glassmaker and artist. Q. Hi Kenny, thanks for agreeing to the interview today. How are you? A. I’m very well, thank you. Q. Firstly, can you tell us a little bit about your background as a glassmaker? When did you first start out making handcrafted glass? A. I’ve always wanted to make glass. I left school at 16 to become a glassmaker, and that’s when I took on a five-year apprenticeship. After that I became a designer and production manager at a place called Selkirk glass. I was there for around 10 years, and used a lot of traditional methods to create glass that people collected all around the world. After that, I started making some stuff for museums and various different places, as well as taking commissions from clients. Q. And what first got you started making cremation glass? A. Well, I actually only started making cremation glass around three years ago. However, I had the idea about 22 years before; it’s just the opportunity never really came along for me to do anything about it. So, I was really excited when a local funeral director first approached me about it, and I began making memorial glass pieces. Q. Is the process quite similar, or did it take a while to get used to at first? A. It’s been a big learning curve, to be honest. I’m a professionally trained glassmaker, having been making glass designs for 24 years now, so suffice to say you really need that knowledge first. There’s so many aspects to consider, such as different temperatures, how the glass reacts to certain materials, how to cool it down, heat it up, keep it stable. It’s like a chemistry all of its own. When it came to making cremation glass, the experience I’d gained over those 24 years really helped me to master this new, different style. That base knowledge definitely helped me adapt a lot faster. Q. Did it feel odd at first, working with people’s ashes? A. You know, it might for some people, but to be honest it’s something I’ve never really thought about that way. I take a lot of care in them for what they are, and I have so much pride in my work when delivering the finished result. It’s such an important, personal thing to so many people and that’s really the way you have to look at it. Q. What’s the best thing about making ashes into cremation jewellery? A. I’d say definitely for me at least, the best part of making cremation jewellery is what you get out of doing it. It’s the reaction you get from the end customer; the people you get to know along the way, and how happy you make them. If you can do that for someone, it makes you feel really good. Reading the hundreds of positive reviews from customers gives me a really warm feeling. Q. Have you ever had any struggles along the way? A. You live and learn, really. I make a point of never really putting anything out if I can put my name to it, but at times it can still take a bit of trial and error. For instance, when trying to get a very specific colour that I’m not used to making, I might have to experiment a few times before I’m confident enough to add in the ashes. 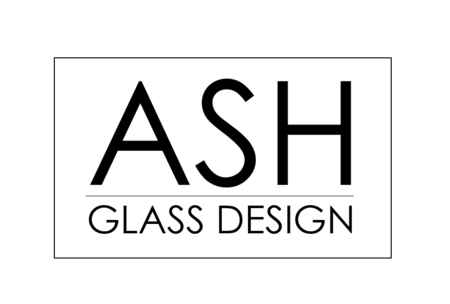 Q. What’s the main ethos behind Ash Glass Design? A. I really wanted to make memorial glass jewellery affordable for anyone who’s ever lost a loved one. Creating an everlasting memory for people to hold onto, something that brings them comfort – whether that be jewellery or a piece of art – it’s something that’s so personal. It should be an option for anyone who wants it. And because all of our jewellery is handcrafted, I wanted to ensure all of my customers are treated with the utmost consideration and care. They’re not just a number to me, I want them to feel like they can pick up the phone at any time, and never be too scared to get in touch or ask a question. Q. Are there any more products you’ll be looking to introduce in future? A. Yes! I’m planning to introduce some more sculptures, along with possibly some more contemporary jewellery as well. I’m going to try and do a sculpture featuring hearts, and introduce some different colours for my sculpture ‘Circles of Life’. Let’s just say I’ve got a few more ideas in the pipeline, so stay tuned! Q. That’s amazing news! Well, thanks for taking the time to talk to us today, Kenny. Well, there we have it! The personal side of memorial glass jewellery making is so often hidden, but it doesn’t have to be. If you’re considering ordering cremation glass jewellery, it’s always a good idea to phone up and see if you can speak to the person who’ll be making your special piece of jewellery or art. It could really help set your mind at ease! Have you got a question to ask Kenny about his memorial glass designs? Just leave a comment below!